You Are Here:inkXE Blog Web to Print How to Make Screen Prints Last Longer with Proper Curing ? 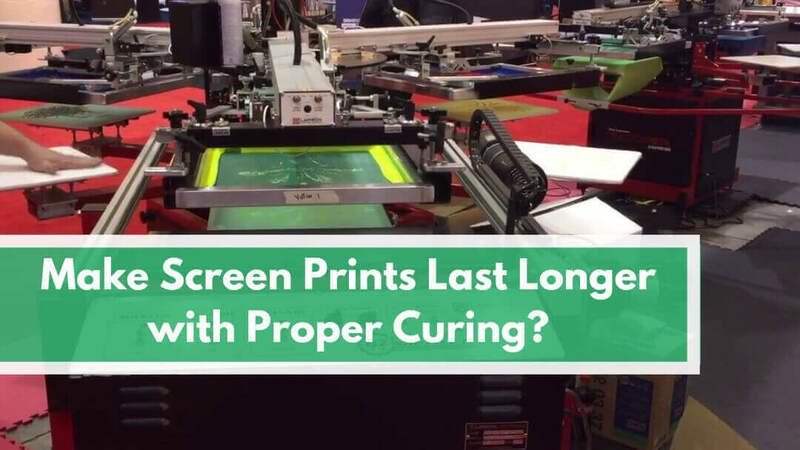 When experienced screen printers first started their venture, little did they realized the factors involved in properly curing their prints. If you too are screen printers, you would know of the stories of how people tried to cure their t-shirts in their kitchen oven. Many use flash cure or buy a heat gun from a local hardware, in spite of the fact that people use a heat gun to bake and strip-away paint. It didn’t take much time for them to realize that these ideas were only making their production suffer. Although there are many creative ways to cure your screen printed t-shirt, the best and most recommended solution is to employ a conveyor dryer if you are looking to build a professional screen printing shop. There is really no substitute for conveyor dryer when you are looking for a long-term success and produce high-quality prints. It is the most financially viable option for you. However, you need to find a dryer that best fits your workspace and your work process and production quantity. You also have to make sure that you are using the right curing techniques based on the ink you are using. Two most common types of ink for screen printing include plastisol and water-based ink. For plastisol ink, the curing has to be done at 320° F, some as low as 280° F. Plastisol is the industry standard for creating opaque and durable prints. Here, you have to check the data sheet from the manufacturer of each plastisol ink you use. On the other hand, water-based ink use water as a solvent to hold the pigment. This means, it demands complete evaporation for a proper cure, so it needs a longer dwell time of at least 90 seconds to several minutes. The curing temperature may range from 300° F to 360° F. using additives you could bring it down to as low as 200° F to 280° F. For the best results it is logical to check the technical sheet from the manufacturer. If you follow your manufacturer’s recommendation completely, it will overwhelm you to decide what to do and what not to. So, the best way to ensure that the cure is perfect you need to put it through the test such as a wash test. It is still one of the best methods to ensure that you did the curring properly and also the fact that the dryer is working properly. Many screen printers do it only when they are dealing with a big order or when the type of garment used is prone to have defects such as special effects, gel inks etc. You can do it simply – you put it through the laundry just like one does in the real world. If the print stays on without showing any defects, you can rest assure that the curing is perfect. If you find that some of the print colours have washed off, you can conclude that the ink wasn’t properly cured. The amount of print degraded will give you an idea of how insufficient the cure was. Many manufacturers wait for nearly 24 to 48 hours before doing a wash test to get more accurate results. However, it is worth noting that you cannot prevent 100% of the print from deteriorating, you need to determine the best and acceptable tolerance of deterioration before shipping it to customers. Many print businesses conduct a wash test from time to time to see if their dryer is working properly. Another common curing test is the stretch test in which you will have to stretch the t-shirt to one half the stretch capacity. If the print doesn’t crack when you relax the fabric, you can be sure that the ink is cured. Most common issues with today’s organic blends are bleeding in which dye gas traps under the ink, thereby discolouring it. Other issues such as ghosting also arise which creates a soft halo around the print. Then there is the problem of see-through prints. 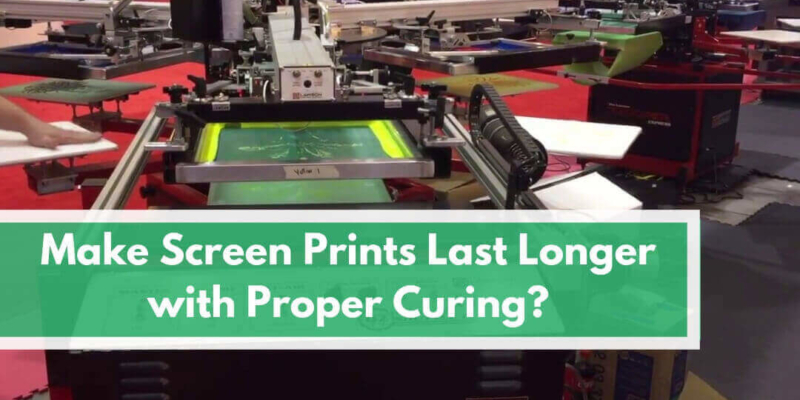 There is also the problem of shrinkage and scorching which have led screen printers to look for inks that they can cure at low temperature. Getting the right cure can be a tough task but with a solid understanding of the basic curing needs and tests you can get the result you crave for. Plus, if you have a print shop, you need to automate the process with a web-to-print solution to make your production much faster, easier and in a cost-effective manner.